Do your parents and grandparents talk about having Bonomos Turkish Taffy when they were kids? 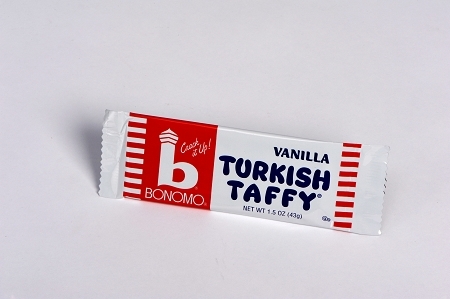 Well Bonomo Turkish taffy is back in all of the original flavors! Try this classic vanilla taffy bar today to see what your friends and family are talking about! With each piece you crack off, youll be reaching for more! Interested in trying a different flavor? Our taffy comes in all four original flavors: chocolate, strawberry, banana, and vanilla. Check out our other product pages for all the different sizes! I JUST WANTED TO TELL YOU THAT THE FIRST TIME I SAW TURKISH TAFFY WAS BACK I BOUGHT 10 BARS!!! I AM AND WAS ADDICTED TO VANILLA TURKISH TAFFY...EATING IT RIGHT NOW! LOVED IT THEN AND LOVE IT NOW. BRINGS BACK MANY GREAT MEMORIES! We were delighted to find Bonomo Turkish Taffy at the Northwoods Candy Emporium in the Mall of America, Minnesota! Just as tasty as I remembered from childhood. Blast from the Past!